When last issue ended, I thought I had some idea of what was in store for Daredevil this week. I’m not talking about the details, of course, but I figured I had at least some vague sense of the ride ahead. As it turns out, Mark Waid has come up with a plot for this issue that is so different in both tone and resolution that I realize I never could have anticipated the the full weight of Daredevil’s predicament. And I absolutely love the unpredictability of it all. 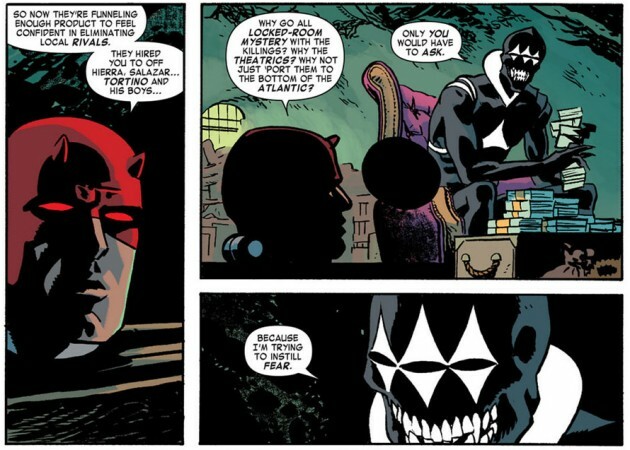 Contrary to the image of retro fun and swashbuckling that has been attached to the Daredevil series since the relaunch, we’ve actually seen our title hero tackle some pretty heavy stuff so far, and Mark Waid certainly hasn’t held back his morbid side. Daredevil #20 is the best example so far of just how dark and brutal Daredevil’s world can be. It features a mixture of classic superhero tropes (e.g. the talkative self-important villain with exotic powers) and real-world situations that combine to make the story much more disturbing than what I would have thought possible. This is what you get when you take a powerful villain and have him set his goals a little higher than devising ludicrous schemes to get back at the hero that put him to shame the week before. This is not a feel-good issue. The only thing that feels good is the realization that a mainstream superhero comic can be compelling enough to actually make you feel so bad. Another surprise of this issue comes in the form of something which doesn’t happen. At least not yet. Last issue, we watched in horror as Foggy got a little too talkative with Matt’s new love interest, District Attorney Kirsten McDuffie. The fall-out of Foggy’s indiscretion is bound to be bad news for Matt in the near future, but here Waid makes the interesting choice of using this piece of the puzzle for something else entirely. Instead of putting Matt on a collision course with the nearest psych ward, we see Kirsten pitted against her overtly sexist superiors. I’ve previously described Chris Samnee’s art as charming. It may sound like a strange choice of word, but I still think it’s a good fit. His characters have a softness to them that really appeals to me. Considering the rather shocking subject matter of this issue, one might assume that the guy responsible for the, let’s face it, downright adorable artwork of Daredevil #12 wouldn’t be the best pick for a creepy horror story. However, not only is Samnee more than capable of handling the darker mood of this issue, his ability to infuse every character with emotion and a touch of humanity makes this tale all the more tragic. This may be some of his best work yet on Daredevil and I’m absolutely in love with it. The colors by Javíer Rodríguez also help capture the darker interior of the Coyote’s lair and the overall mood of this story. Kudos to everyone involved. I’m sure this story isn’t for everyone. I can see how some might find it too twisted, too outlandish or even a bit silly. Yes, even considering the Coyote’s level of pure evil. I, however, am a big fan. Daredevil #20 is a great looking piece of perfectly paced horror and exhilaration. Waid and the rest of the team are clearly as fearless as the main character in their approach to storytelling. This wasn’t my cup of tea. But really, the art and especially those colours were enough to say that it was enjoyable. I hope Samnee doesn’t go off on something else soon. He deserves a nice run on this book. Yeah, I can easily see why this issue isn’t everyone’s cup of tea. Like I said, I loved it, but it’s far enough “out there” that it really comes down to personal taste. I wasn’t super crazy about the Latveria arc (or the Omega Effect) myself – they were good, but not outstanding – but this arc has me hooked. I don’t yet know whether I like the direction this arc is taking … but I am deeply impressed that Waid has so effectively raised the villain bar with Coyote. I’m still not sold on that name, but damn. I had actual nightmares about that twist. This arc is indeed shaping up stronger than the Omega Effect. Conversely, I felt that Kirsten’s sexist superiors came across as a little flat. Maybe it’s because the sexism I’ve experienced in the workplace was either more subtle (such as accounting shell games to pay women less than men) or more overt (the shift manager who groped female employees when business was slow), but I don’t buy the notion that her bosses would make snide comments about TMZ and dismiss her ideas to her face … rather than simply fire her or stick her with pointless busywork that will drop her career into the nearest dumpster. Especially when, as Matt has pointed out, New York is an at-will employment state, and they can fire her for no reason at all as long as they don’t give her cause to sue–say, by making snide sexist comments about her girly emotionality. It just seems less than realistic to me that they’d take that middle path, so fraught with legal peril. Especially when they’re lawyers. Still, this was an excellent review of a great issue and I look forward to what follows, in your case and Waid/Samnee’s. I am both awed and shocked over this issue. Tying Coyote’s schemes into real-world crime issues only served to heighten the horror and magnitude of his actions. Samnee does a terrific job here, the first glimpse of the closet is stunning and utterly creepy. Waid keeps up guessing with this new twist to Coyote’s tale. Once again, he delivers a powerful story, full of dread, and only Waid knows what will happen next for I surely do not. I also like how this serves as an example of the the different types of genre that DD can accommodate from swashbuckling to espionage to now horror.